But the Hourglass has an advantage. Lily, who has the ability to locate anything lost, has determined that the Infinityglass isn’t an object. It’s a person. And the Hourglass must find him or her first. But where do you start searching for the very key to time when every second could be the last? After the spectacular blow up of action in Hourglass and Timepiece, I was a bit disappointed how this started slowly. I didn’t stay disappointed for long. Since this was an eARC, the formatting was a bit off, which as a bit irritating with the dual POV. That has nothing to do with the actual story, and more a personal preference. Dune was a very likable character from the first two books. I was glad i finally got to see more of him. He did feel a bit randomly thrown in at times in Hourglass and Timepiece, but I as pleased to see him get his own chance to tell his story. His loyalty to the Hourglass and his desire to protect Hallie are very well done. Hallie is a difficult person to get a read on in the beginning. She’s so closed and standoffish that it almost makes it hard to like her. Until Dune breaks down her defenses. the way she was raised – almost like a prisoner doesn’t help her way of feeling like she doesn’t need anyone or any help. The realisation that she is the Infinityglass that people start fighting over really throws her off her game. She quickly adjusts and accepts Dune’s help. Against both their better judgements, they find themselves falling for each other. Dune is such a gentleman even though he is very much a teenage boy. It’s a refreshing change from reality. I wish more teen boys had the respect and mannerisms that Dune has! The fight against Hallie’s mom (the head of Chronos) is heart wrenching and I wish Hallie didn’t blame herself for the events that come to pass. Despite the darkness from the threat and fighting with her momand Hallie’s penchant for relying only on herself, it’s great that she lets herself accept help from the other members of Hourglass. This series was a great one to find via recommendation and I gladly pass on the recommendation! I definitely plan to revisit this wonderful series again in the future! Kaleb Ballard was never supposed to be able to see ripples – cracks in time. Are his powers expanding, or is something very wrong? Before he can find out, Jonathan landers, the man who tried to murder is father, reappears. Why is he back, and what, or whom, does he want? In the wake of Landers’ return, the Hourglass organization is given an ultimatum. Either they find Jack and the research he’s stolen on the people who might carry the time gene, or time will be altered – with devastating results for the people Kaleb loves most. I blew through Hourglass and quickly jumped into Timepiece. Even though I was enjoying being away at the beach, reading about TN warmed my heart. I fell in love with Kaleb when he first met Em. Adorable and lost Kaleb. For a heartbeat, I really loved the thought of him and Em together. Then I realised Em and Michael were too perfect together. 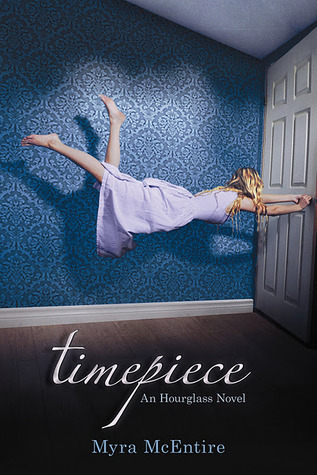 Also because Kaleb really meets his match in Timepiece. Kaleb is also in touch with what could be considered his feminine side. He knows his way around a kitchen. What girl doesn’t love a guy who knows his way around a kitchen? C’mon, ladies, fess up! Kaleb’s match is Lily. She’s the fierce and protective best friend of Emerson. She reminds me of my childhood best friend, Brydget. She’s fiercely loyal, has a mind of her own, and knows what she wants. Very admirable. She also makes Kaleb work for her affections. Guys need to learn that a girl isn’t just gonna give it up because you give her the time of day! Lily also brings out the best in Kaleb by letting himsee he doesn’t have to drown his pain. Rips are becoming more common place and everyone with the time travel gene is now able to see them. Rips are also becoming more defined. Not just one at a time, but multiple people. The gang also learns about the Infinityglass that may be the solution to help heal the time continuum. They are threatened by Chronos to bring Jack Landers to them or the time continuum would be fixed and no one knows what the implications would be. Kaleb is surprised to discover Lily also has an ability. She can find things, and also has a latent time travel gene because she too can see the rips. They journey to discover just how powerful she could be. Everyone is surprised to find out she is more powerful than any of them could imagine. Her grandmother tells her that each generation the ability becomes stronger and that’s why they fled from Cuba – to protect her. 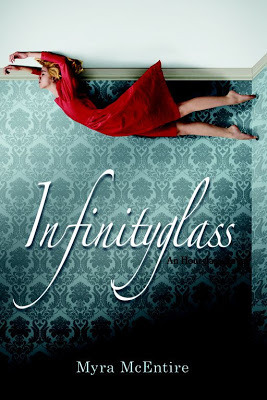 In the end we discover more about the Infinityglass and that it isn’t an object, but a person. I really enjoyed reading from Kaleb’s POV. It’s a nice change from the continuous streams of girls’ POVs I’ve been reading lately. This was a spectacular sequel which continued the magic from Hourglass, just switched gender perspectives. Recommended for: Time travel enthusiasts, those who love swoon worthy boys and another kickass heroine! Not recommended for: Those who dislike time travel. One hour to rewrite the past . . .
For seventeen-year-old Emerson Cole, life is about seeing what isn’t there: swooning Southern Belles; soldiers long forgotten; a haunting jazz trio that vanishes in an instant. Plagued by phantoms since her parents’ death, she just wants the apparitions to stop so she can be normal. She’s tried everything, but the visions keep coming back. So when her well-meaning brother brings in a consultant from a secretive organization called the Hourglass, Emerson’s willing to try one last cure. But meeting Michael Weaver may not only change her future, it may also change her past. Who is this dark, mysterious, sympathetic guy, barely older than Emerson herself, who seems to believe every crazy word she says? Why does an electric charge seem to run through the room whenever he’s around? And why is he so insistent that he needs her help to prevent a death that never should’ve happened? This was recommended to me by the lovely Jodi Meadows on Twitter. I’ve been itching to get my hands on it ever since. I decided I wanted some for fun books to read at the library and checked this out from my library’s e-book loaning system. This book was so addicting! I loved it! I also loved that it takes place down in middle Tennessee. That area holds a special place in my heart just like east Tennessee. I’ve been toying around with a time travel idea for a novel for ages, but haven’t had any experience with published ones to see how it could go. 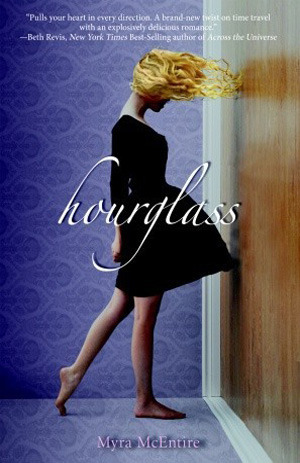 After reading Hourglass, I fully intend on fleshing out that idea! I absolutely loved Em. Right from the beginning I admired her. She has a quiet strength that makes her frequently underestimated. She’s also extremely determined. Love that in a strong female protagonist! A girl who isn’t afraid to get her hands dirty to figure out things is a good friend of mine! And the sass! Oh she’s got that sassy Southern girl down pat! Kaleb. Oh. Kaleb. I love him. He’s so adorable and lost. He just needs a good cuddle! I stepped forward with my hands on my hips, only slightly intimidated to find Kaleb almost eye level with me when he was seated and I was standing. Time travel. This aspect was so beautifully done! Seeing rips was fantastic. I’ve had dreams through the years similar to this and with all the traveling I’ve done this is something that can work beautifully or disastrously! Myra did a perfect job! I love how they cautiously deal with time travel and that the characters are very aware of the consequences that could come from screwing with the time continuum. I’m one of those strange people who would NOT go back and change anything in my past given the chance. Nope. I’m a firm believer in the past happens for a reason to shape your future and if that’s screwed up, duh! It would screw up your future. Yes, I still ponder the what ifs, but I wouldn’t actually act on them. I really admire Em’s ability to throw that to the wind when necessary thought! “No matter what your reality looks like, you’re the girl I’m in love with today, and the same girl I’ll be in love with tomorrow and all the days after that. Not just because of who you are, but because of who you were. Did I mention cold shower worthy? I mean, whoa. This book is the full package. Action, intrigue, romance? What more do you need? Go get this NOW! Or… you know… my birthday is at the end of the month. You can get it for me! Recommended for: Time travel enthusiasts, those who love swoon worthy boys and a kickass heroine! Not recommended for: Mushy romance haters, those who dislike time travel.